Lincoln, which was initially called Lincoln Center, was named in honor of Abraham Lincoln in 1870 by George Green, the founder of the town. A close neighbor and several cousins of Abraham Lincoln had settled here. As the county seat, it features the beautiful courthouse built in 1900 which is now listed in the National Register of Historic Sites. Located in the Heart of Post Rock country, limestone buildings in downtown Lincoln are beautiful representations of the use of the unique limestone layers that were discovered by early pioneers as being very useful for building materials in an area of very few trees. 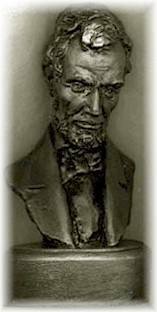 In February, Lincoln becomes the Land of Lincoln Look-A-Likes during the annual Lincoln Reenactment Day, and the fun continues again on Labor Day for the Post Rock Festival. This dragon sculpture is one of many Creature Creations built by J.R. Dickerman viewable in his "Open Range Zoo"